If your business is strictly service-oriented...and NON-retail, it's pretty easy to make your report to the city and to the state. If you are a retail business, or a combination of service + retail, click here to read a different walkthrough. (Coming soon.) To learn more about Service vs. Retail Services, click here. 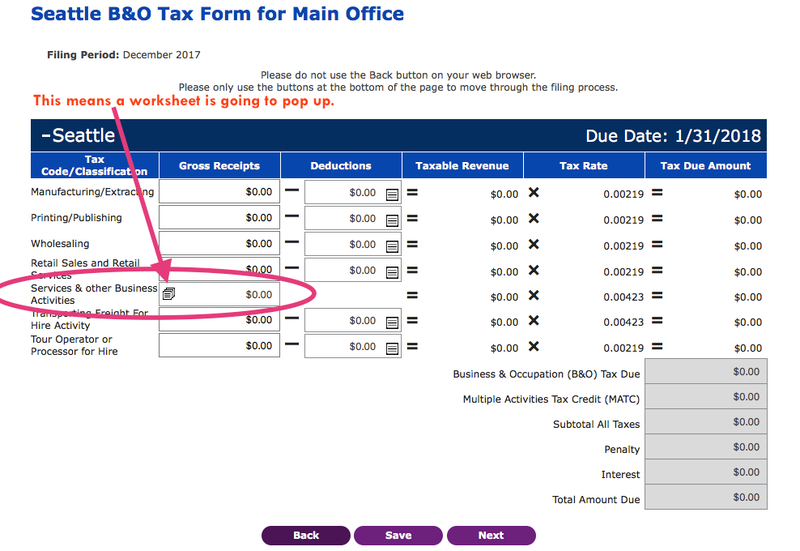 Cost/Taxes Due: If you earned under $100K, then you will NOT pay any taxes. To read about tax rates for over $100K with Seattle, click here. • Gross Sales—The total amount of money you collected from your work. (That's it, no need to figure out deductions yet.) Can also referred to as Gross Service Receipts. • Log In + password to either FileLocal. ♥ Ask a friend to sit next to you the first time, to be a 2nd set of eyes. 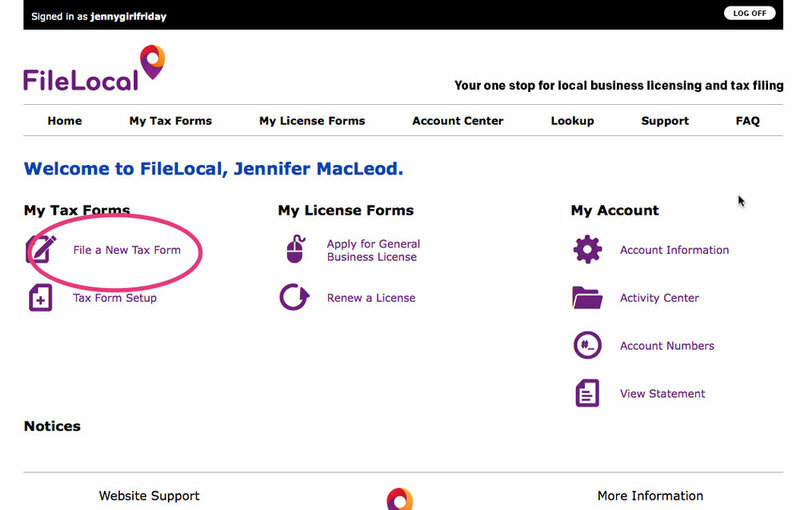 Click here to go to FileLocal. For ANNUAL filers (most or all of you) ... we select December of the desired year. 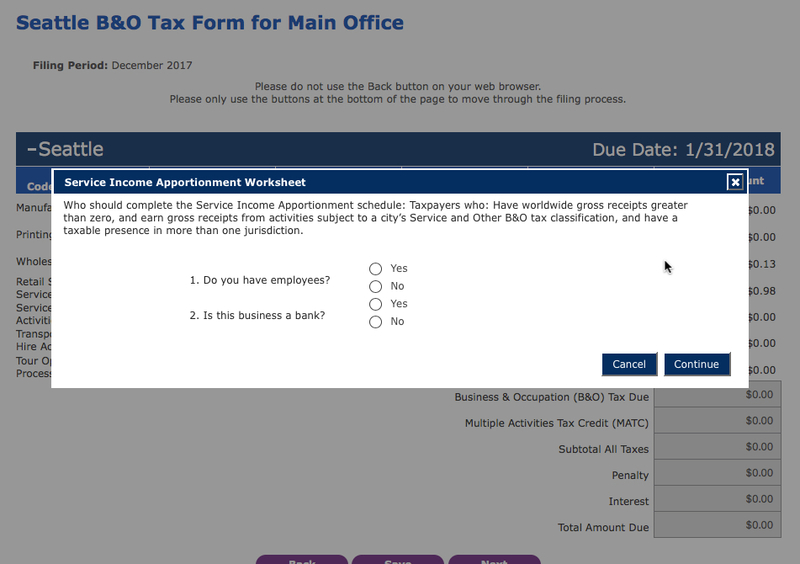 If there are No tax forms in the dropdown menu, you’ll need to do another little process…….you’ll have to Add Tax Forms to your profile. (A walkthrough is coming.) Meanwhile, scroll to the bottom of this post for the basic steps. After you answer these questions, the worksheet will expand. Note: you are NOT an employee; you're the owner. Here's the same worksheet with some numbers filled in. Enter the amounts in lines 1 and 7. The worksheet will populate with more numbers. Line 12 says, "Seattle Taxable Receipts". This should match the amount of total sales for your business that happened in Seattle. After you hit "continue" it takes you back to the screen you were on. Review, and if things look good, hit Next. When everything looks good, hit File Now. The newest version of FileLocal actually has you confirm 4 times. Only two are shown here. Note ~ The first two times I hit Yes, I got an error screen! I waited a few days, tried again....I logged in, all my numbers were still there, and then it worked! Who knows why. Here's what the confirmation page looks like, plus you'll get an email confirmation. 7 - Once complete, go back to the home screen to start again. Well done! One important hoop is over. Reporting your gross sales is a great moment ... you get to see all of the business you accomplished over the last year. P.S. I’m working for TIPS! If this was helpful, please consider leaving something in the Tip Jar.